Name Variation Patrick J. O'Neil was also known as O'Neal. Patrick J. O'Neil was born in March 1856 at Ireland. He married Mary N. (?) circa 1875. Patrick J. O'Neil died after May 1910. Patrick J. O'Neil was a coal miner in 1880. He had 6 with 5 living in 1910 children. He was a coal miner in 1910. [S246] U.S. Federal Census 1880 U.S. Federal Census, by Ancestry.com, NA Film Number T9-0222 Page Number 59D. [S244] U.S. Federal Census 1910 U.S. Federal Census, by Ancestry.com, ED55. Dwelling 1. Name Variation Hellen O'Neil was also known as O'Neal. Hellen O'Neil was born in February 1896 at Montana. Married Name circa 1875 As of circa 1875,her married name was O'Neal. Married Name circa 1875 As of circa 1875,her married name was O'Neil. Mary N. (?) was born in March 1860 at Ireland. She married Patrick J. O'Neil circa 1875. Mary N. (?) died before 1910. Mary N. (?) had 16 with 8 living in 1900 children. Name Variation Patrick O'Neil was also known as O'Neal. Patrick O'Neil was born in February 1878 at England. He was the son of Patrick J. O'Neil and Mary N. (?). Name Variation William O'Neil was also known as O'Neal. William O'Neil was born in May 1880 at Illinois also reported as May 1881. Name Variation Elizabeth O'Neil was also known as O'Neal. Elizabeth O'Neil was born in June 1889 at Illinois. Name Variation Julia A. O'Neil was also known as O'Neal. Julia A. O'Neil was born in August 1891 at Montana. Name Variation May O'Neil was also known as O'Neal. May O'Neil was born in November 1893 at Idaho. Name Variation Margaret O'Neil was also known as O'Neal. Margaret O'Neil was born circa 1875 at England. John A. Burns was born in 1868 at Wisconsin. John A. Burns died on 5 March 1949 at Lemmon, Perkins, South Dakota. He was buried after 5 March 1949 at St Malachy Cemetery, Clyde, Iowa, Wisconsin. Name Variation Catherine W. Burns was also known as Kate. Name Variation Catherine W. Burns was also known as Katherine. Married Name 9 August 1902 As of 9 August 1902,her married name was Torphy. Catherine W. Burns was born in November 1873 at Iowa, Wisconsin. She was the daughter of James Burns and Martha Connors. Name of person pronouncing marriage - Rev. Joseph RUSTERER? Date of registration - Aug 20, 1902. Catherine W. Burns was buried in August 1960 at Saint Bridgets Cemetery, Ridgeway, Iowa, Wisconsin. She died in August 1960 at Iowa, Wisconsin, at age 86 Mrs. Catherine Torphy, 87, a lifelong resident of the Ridgeway area, died Friday at a Dodgeville hospital. The body was taken to the Ayres funeral home, Ridgeway, where friends may call after 2 p.m. today. The rosary will be recited at 8 tonight at the funeral home. Services will be at 11:30 a.m. at St. Bridget's Catholic Church. 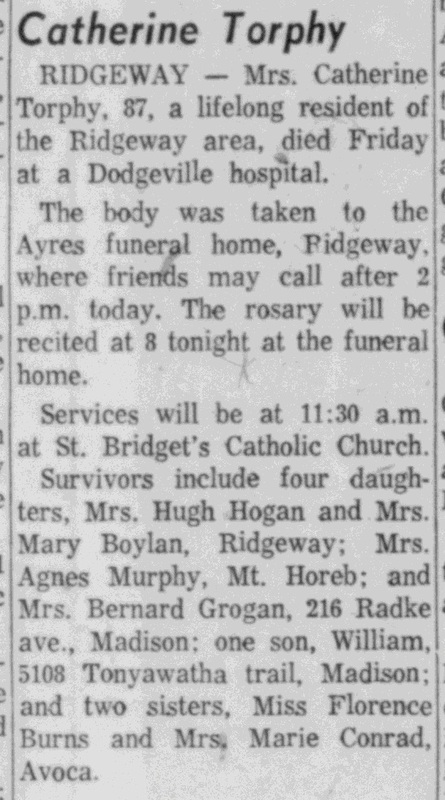 Survivors include four daughters, Mrs. Hugh Hogan and Mrs. Mary Boylan, Ridgeway; Mrs. Agnes Murphy, Mt. 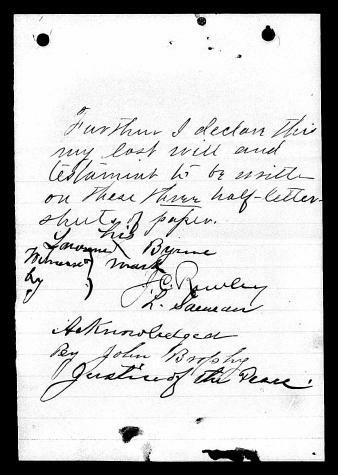 Horeb; and Mrs. Bernard Grogan, 216 Radke ave., Madison; one son, William, 5108 Tonyawatha trail, Madison; and two sisters, Miss Forence Burns and Mrs. Marie Conrad, Avoca. Thomas Henry Burns was born on 21 June 1875 at Wisconsin. Thomas Henry Burns died on 15 September 1949 at Miami, Florida, at age 74. He was buried after 15 September 1949 at St Malachy Cemetery, Clyde, Iowa, Wisconsin. Married Name circa 1908 As of circa 1908,her married name was Gotham. Nellie Burns was born in August 1877 at Wisconsin. Nellie Burns married Frank Gotham circa 1908. Nellie Burns died between 1951 and 1960. Frank Burns was born in 1880. Frank Burns died on 10 November 1895. He was buried after 10 November 1895 at St Malachy Cemetery, Clyde, Iowa, Wisconsin. Name Variation Marie Angela Burns was also known as Mary. Married Name 24 January 1917 As of 24 January 1917,her married name was Conrad. 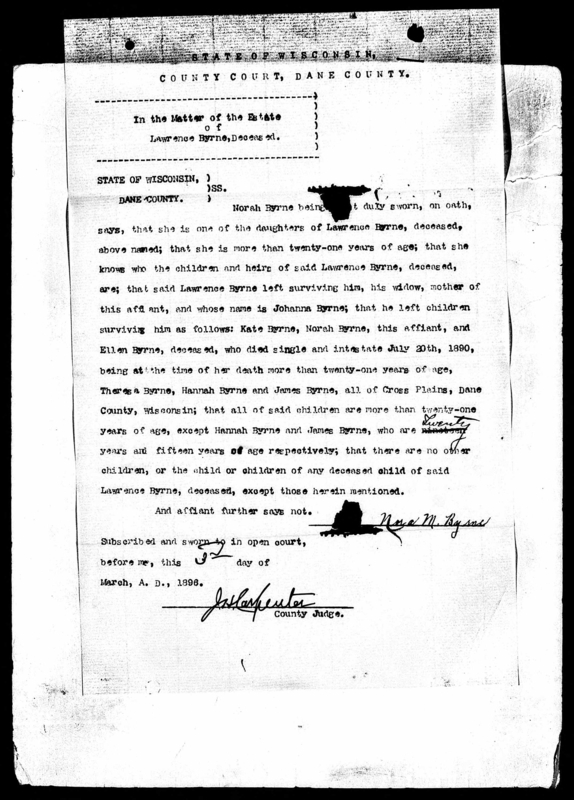 Marie Angela Burns was born on 15 November 1883 at Wisconsin. Marie Angela Burns married Harry Andrew Conrad on 24 January 1917 at St. Malachy's Church, Clyde, Iowa, Wisconsin, the groom was the district manager of the Balso Oil Co. in Storm Lake, Iowa. Marie Angela Burns died on 26 June 1966 at age 82. 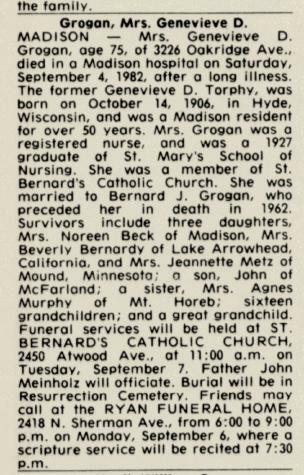 She was buried after 26 June 1966 at St Malchy Cemetery, Clyde, Iowa, Wisconsin. Marie Angela Burns was a school teacher at school house in 1910. [S244] U.S. Federal Census 1910 U.S. Federal Census, by Ancestry.com, Year: 1910; Census Place: Township 5, Stanley, South Dakota; Roll: T624_1488; Page: 3A; Enumeration District: 0126; FHL microfilm: 1375501. [S243] U.S. Federal Census 1920 U.S. Federal Census, by Ancestry.com, Year: 1920; Census Place: Storm Lake, Buena Vista, Iowa; Roll: T625_480; Page: 14B; Enumeration District: 14; Image: 608. Name Variation Florence Julia Byrnes was also known as Burns. Florence Julia Byrnes was never married. She was born on 18 November 1885 at Wisconsin. Florence Julia Byrnes died on 26 October 1963 at Iowa, Wisconsin, at age 77 Miss Florence Byrnes, 77, an Avoca resident since 1955, died Saturday, Oct. 26, in a Dodgeville hospital after a short illness. 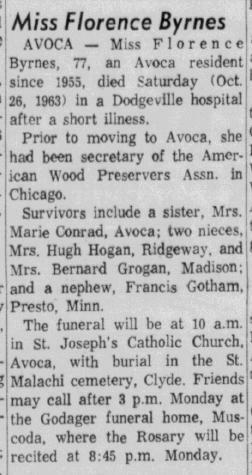 Prior to moving to Avoca, she had been secretary of the American Wood Preservers Assn. in Chicago. 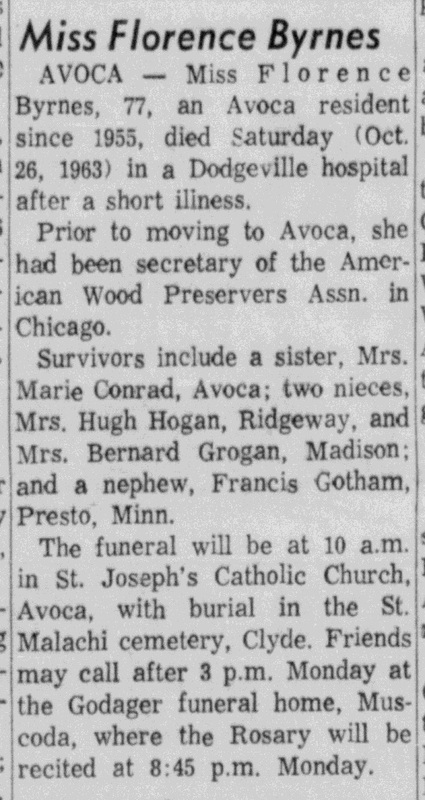 Survivors include a sister, Mrs. Marie Conrad, Avoca; two nieces, Mrs. Hugh Hogan, Ridgeway; and Mrs. Bernard Grogan, Madison; and a nephew, Francis Gotham, Presto, Minn. Funeral services were held on Tuesday in St. Joseph's Catholic church, Avoca with burial in St. Malachy cemetery, Clyde. She was buried after 26 October 1963 at St Malachy Cemetery, Clyde, Iowa, Wisconsin. Catherine Burns was born in February 1891 at Wisconsin. Catherine Burns died before 1951. Name Variation James Connors was also known as Conor. James Connors married Sarah Morton. James Connors was born circa 1814 at Ireland. Sarah Morton married James Connors. Sarah Morton was born circa 1821 at Ireland. Married Name Her married name was Burns. Catherine (?) married James Burns. Catherine (?) was born circa 1794 at Ireland. She died after July 1870. [S247] U.S. Federal Census 1870 U.S. Federal Census, by Ancestry.com, Page 1. Stamp 135. Dwelling 1. Name Variation Thomas Byrne was also known as Burns. 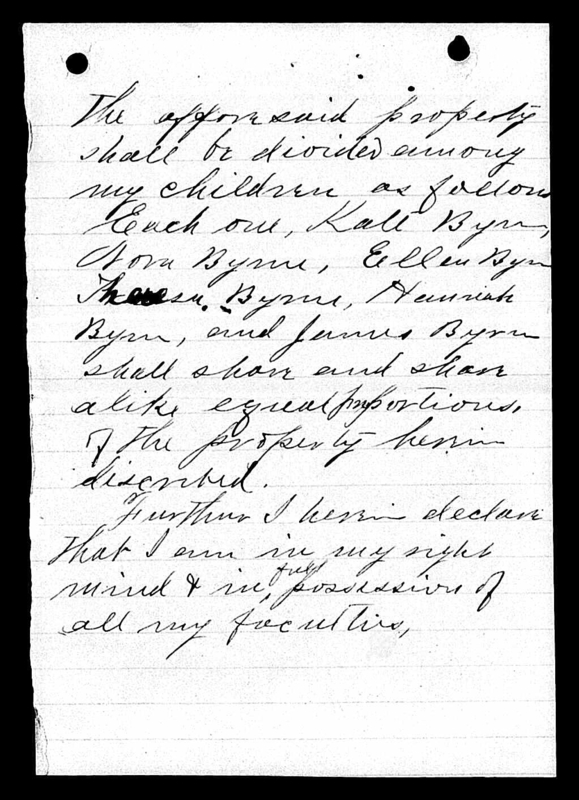 Thomas Byrne was born circa 1830 at Ireland. Name Variation Lawrence Byrne was also known as Burns. Name Variation Lawrence Byrne was also known as Byrnes. Name Variation Lawrence Byrne was also known as Laurence. Lawrence Byrne was born circa 1825 at Ireland. 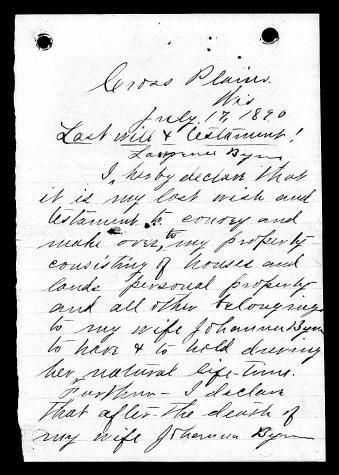 Lawrence Byrne married Johanna Kenny circa 1861. Lawrence Byrne died on 18 July 1890 at Wisconsin. He is mentioned in the obituary of Ellen Byrne on 20 July 1890 at Wisconsin; Ellen Byrne obituary; was engaged to be married to Reinhold Schott, the wrestler, but the match was opposed by her father. 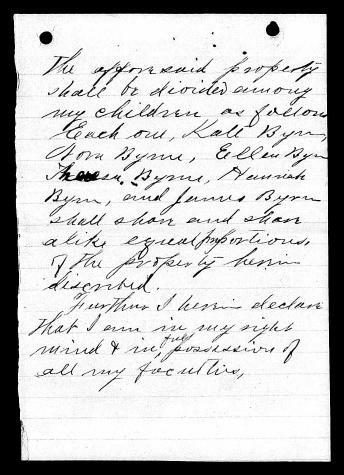 His estate was probated on 3 March 1896 at Wisconsin including affidavit by daughter Norah Byrne. 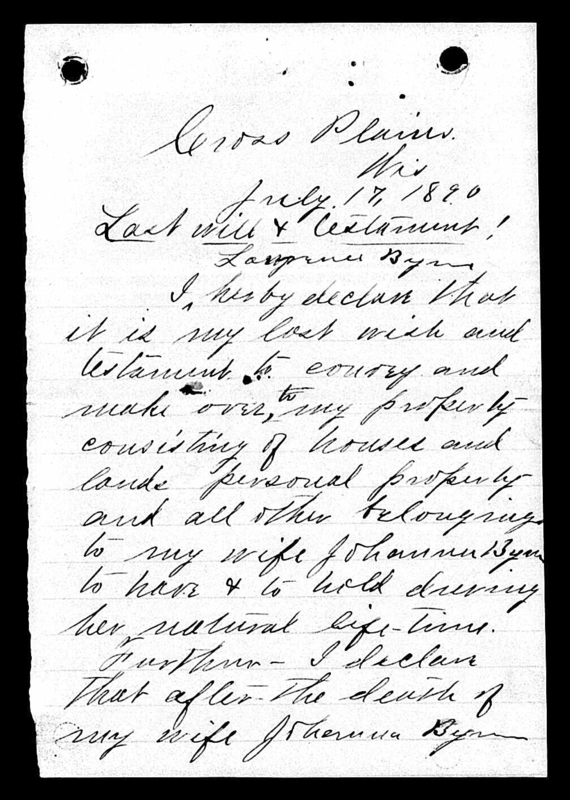 Lawrence Byrne left a will on 17 July 1890 at Wisconsin. Mary Burns was born circa 1832 at Ireland. She was the daughter of James Burns and Catherine (?). Michael Burns was born circa 1842 at Ireland. Edward Torphy was born on 28 December 1862 at Wisconsin also reported as Dec 1861. He was the son of Michael Torphy and Margarite Vaughn. Edward Torphy married Johanna Stapleton circa 1887. 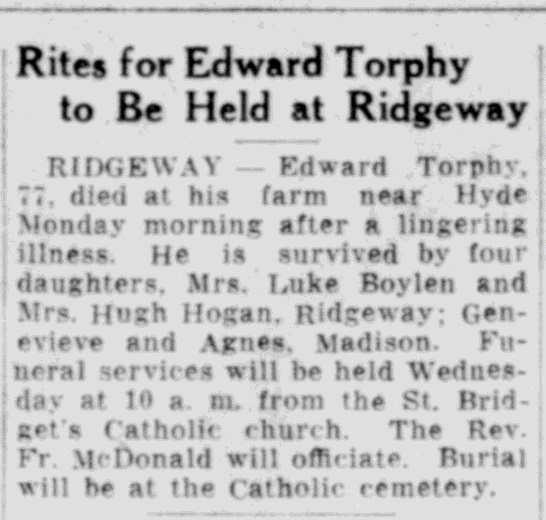 Edward Torphy was buried in 1932 at Saint Bridgets Cemetery, Ridgeway, Iowa, Wisconsin. He died in 1932 at Iowa, Wisconsin, Edward Torphy, 77, died at his farm near Hyde Monday morning after a lingering illness. He is survived by four daughters, Mrs. Luke Boylen and Mrs. Hugh Hogan, Ridgeway; Genevieve and Agnes, Madison. Funeral services will be held Wednesday at 10 a. m. from the St. Bridget's Catholic church. The Rev. Fr. McDonald will officiate. Burial will be at the Catholic cemetery. Name Variation Inez Katherine Torphy was also known as Catherine Inez. Married Name circa 1926 As of circa 1926,her married name was Hagan. Married Name circa 1926 As of circa 1926,her married name was Hogan. Inez Katherine Torphy was born in 1904 at Wisconsin. She was the daughter of Edward Torphy and Catherine W. Burns. Inez Katherine Torphy married Hugh S. Hogan circa 1926. Inez Katherine Torphy was buried in April 1977 at Saint Bridgets Cemetery, Ridgeway, Iowa, Wisconsin. 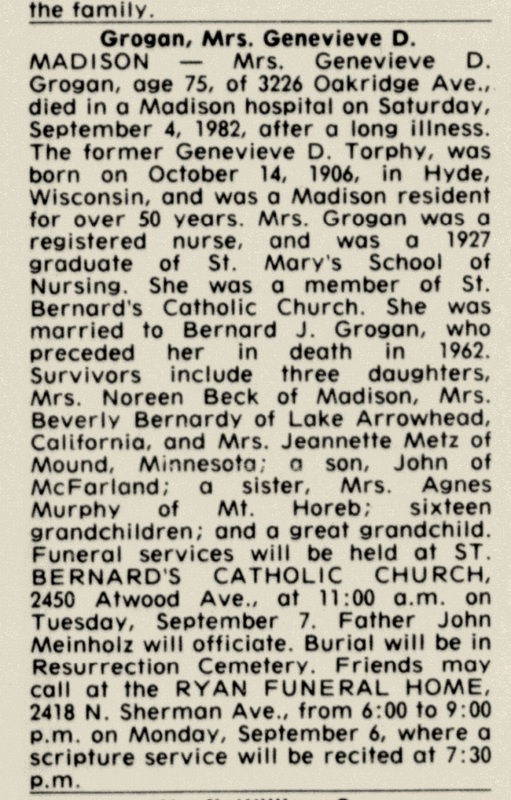 She died in April 1977 at Verona, Wisconsin, Inez (Torphy) Hogan obituary. Name Variation Genevieve D. Torphy was also known as Geneva. Married Name 4 February 1929 As of 4 February 1929,her married name was Grogan. Genevieve D. Torphy was born on 14 October 1906 at Hyde, Wisconsin. Genevieve D. Torphy married Bernard J. Grogan on 4 February 1929. Genevieve D. Torphy was buried in September 1982 at Resurrection Cemetery, Madison, Dane, Wisconsin. She died in September 1982 at age 75 Genevieve (Torphy) Grogan obituary. Harry Andrew Conrad was born on 25 January 1884 at Kansas. He married Marie Angela Burns, daughter of James Burns and Martha Connors, on 24 January 1917 at St. Malachy's Church, Clyde, Iowa, Wisconsin, the groom was the district manager of the Balso Oil Co. in Storm Lake, Iowa. Harry Andrew Conrad was buried in January 1920 at St Malchy Cemetery, Clyde, Iowa, Wisconsin. He died in January 1920. Michael Torphy was born in January 1830 at Ireland. He married Margarite Vaughn circa 1849. Michael Torphy died after 1905. Married Name circa 1849 As of circa 1849,her married name was Torphy. Margarite Vaughn was born in December 1824 at Ireland. She married Michael Torphy circa 1849. Margarite Vaughn died before 1905. Margarite Vaughn had 6 with 2 living in 1900 children.